SAN ANTONIO, TX (Feb. 6, 2019) – McGuyer Homebuilders, Inc. (MHI) is expanding its reach in the San Antonio area, opening models in two new communities and moving into a new section of a current development. Wilshire Homes, part of the MHI family of builders, has opened a new model home in Bindseil Farms in Schertz. Homes by Wilshire are being built on 60-foot homesites in Bindseil Farms and range from 1,584 to 2,821 square feet. Prices start in the $280,000s. The Granbury model, at 2033 Breton Pass, is representative of the 14 home designs Wilshire offers in Bindseil. The two-story Granbury features four bedrooms — two downstairs — a casual dining area open to the kitchen and family room and an upstairs data center. The base floor plan is priced in the $330,000s. Homes by Wilshire are being built on 60-foot homesites in Bindseil Farms and range from 1,584 to 2,821 square feet. Prices start in the $280,000s. Also recently opened is a model by MHI’s Coventry Homes in Carmen Heights near Interstate 10 and inside Loop 1604. Coventry is modeling its Design 2300 in Carmen Heights to showcase the five garden home designs offered in the community. The three-bedroom model features a number of designer accents such as staggered-height kitchen cabinets, a beamed ceiling and planked walls. Base price for the model home is in the $380,000s. The five floor plans range from 1,659 to 2,840 square feet and are priced from the $360,000s. 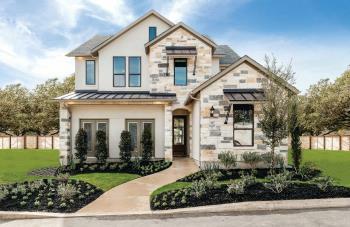 Coventry Homes also is now offering larger floor plans for 60-foot homesites in Esperanza, a Boerne master-planned community featuring 350 acres of parks and open spaces, nature trails and several planned amenities. The five new designs range from 2,087 to 3,376 square feet and offer up to five bedrooms. Pricing is in the $330,000s. The builder also offers homes in Esperanza’s 50-foot neighborhood, with designs priced from the $270,000s and ranging from 1,611 to 2,812 square feet. The homes in these new communities will feature MHI’s smart-home technology package, now standard in all of their designs. The package includes a Control4 CA-1 comfort and automation controller, an Ecobee Smart Thermostat with Alexa voice control, exterior and back door lighting, a Kwikset front door lock, Echo Dot, Control4 smart light switches and a Ring video doorbell. All homes will come pre-wired for a wireless access point and feature a 30-inch Wi-Fi compatible component enclosure. “Having these sought-after items as standard features means home buyers can spend their upgrade budget on the customizations that make their homes personally theirs,” Dadidakis said. For more information about Coventry Homes, visit www.coventryhomes.com. For details about Wilshire Homes, visit www.wilshire-homes.com.